There are at least twelve books in this “Issues” series, printed by Kregel but copyrighted by Dallas Seminary. I have reviewed quite a few of these over the years and have always enjoyed the variety they present. They usually contain fifteen or twenty articles written by various qualified authors. 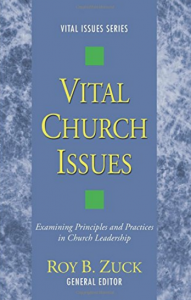 This issue is devoted to the pastor and his ministry. It has many good helps from Ortlund, Stott, Mappes, Gangel and others. The first four are written by Leith Anderson and are my least favorite due to his increasingly presumptuous view of conservatism.